Most people might think of herbalism and other forms of alternative medicine as new-age hippy mumbo jumbo that has no basis in scientific or medical fact. However, there are some rare cases where alternative medicinal treatments are actually backed by science. Chamomile is one such exception. But what exactly is it good for? And how should you take it? We'll answer these questions - and more - about this lovely little plant. Chamomile comes from a flowering plant that blooms all over Europe, especially in Germany and other parts of the mediterranean. It is recognizable by its daisy-like delicate white petals with a bright yellow center in the middle of the flower. The two most popular species, with regard to medicinal use, are Roman chamomile and German chamomile. For many of the conditions above, the scientific evidence of chamomile's efficacy is a little light; however, that doesn't stop some people from swearing by it. 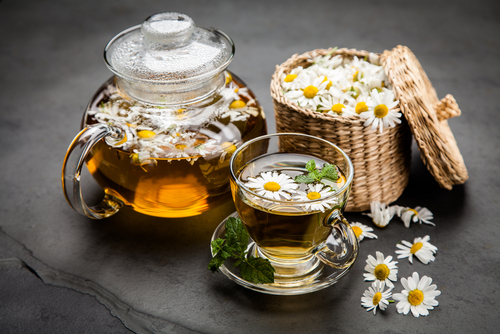 For other conditions, however, there is plenty of evidence that chamomile works - especially when it comes to the serious issues of anxiety and insomnia. As you can see, there are many anti inflammatory and antioxidant compounds which contribute to the plant's medicinal benefits. Furthermore, many of these botanicals interact with the central nervous system, binding to GABA receptors and regulating monoamine imbalances. In layman's terms, it means they increase the amount of endorphins in your brain while reducing the body's ability to feel stressed out and anxious. You may already be familiar with chamomile tea. This has been the most popular way to consume chamomile for centuries. There are many varieties of chamomile tea out there; some are just plain chamomile all by itself, while others mix chamomile with other stress-relieving botanicals for a more potent brew. For many, though, it may be easier to take a capsule than to take the time to brew tea. But not all chamomile supplements are created equal. According to double-blind, placebo-controlled studies, a starting dose of 200 mg pharmaceutical-grade Matricaria chamomilla with a 1.2% apigenin concentration is an effective starting dose. The dose may have to be increased based on body weight and severity of anxiety/sleeplessness symptoms. Lastly, there are natural herbal sleep remedies that contain chamomile (Avinol PM is one of our favorites). Some of them also contain amino acids, like 5-HTP to help promote relaxation further by regulating levels of specific neurotransmitters in the brain. And if you can find a sleep aid that combines chamomile and melatonin, the sleep hormone, that's even better! As a matter of fact, we've reviewed some products that do just that. Take a look at them here.